Probable cause of the Accident: "The PIC pressed TOGA when the thrust on no.1 engine was 40% and no.2 engine was 28% in deviation from SOP, which caused the No.1 engine thrust to increase at a faster rate than no.2 resulting in aircraft yawing towards right. 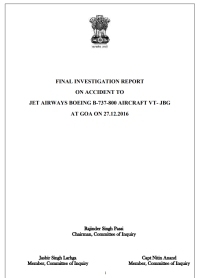 In the absence of timely desired corrective actions including reject takeoff, the aircraft veered off the runway and continued to move in a semicircular arc on the undulated ground resulting in substantial damages to the aircraft." The operator must reiterate the importance of all briefings to flight crew especially emergency briefings. First officers to be more assertive with regards to adherence to standard operating procedures.? Stabilized callout by the PM may be introduced after the initial thrust application of 40% prior to application of TOGA. This callout should imply that both thrust setting are practically identical.? The training department of the operator to incorporate defined failures for unstabilised thrust, uneven spool up of engines during low speed for reject and their corrective actions thereof.? The importance of following the correct actions regarding evacuation and briefing for the same during all simulator training sessions be emphasized. DGCA in co-ordination with the Defence authorities should make the standard „Aerodrome Emergency Plan? for all the Defence Airfield where scheduled civil flights operate as per the latest framework of Safety Management System. AAI which is the custodian of the Civil Enclaves and apron area at these airports, now licensed by DGCA, should have a direct role to play in the procedures of contingency actions in case of an accident. As a onetime exercise, DGCA should check the practical implementation of the ERP of all airlines and ensure that it is rigidly integrated with the AEP of the aerodromes for better handling of the situation & passenger facilitation.? AAIB India must reiterate all the aspects of requirements of detailed Medical Examination of the Flight Crew whenever there is a serious incident or accident by clearly defining the responsibility of individuals involved in the process.? Distance from Goa-Dabolim Airport to Mumbai (Bombay) Airport as the crow flies is 422 km (264 miles).